The first analysis included city-owned protected parkland and beaches, with full or restricted access. 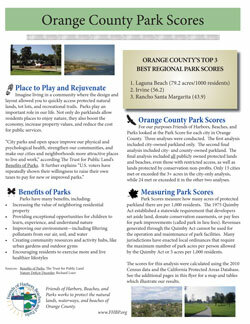 The second analysis included city- and county-owned parkland. The final analysis included all publicly owned (local, regional, state, and federal) parkland or beaches with full or restricted access and included lands privately conserved by non-governmental organizations. The Study was made possible due to a generous grant from Boeing. This publication is copyrighted by FHBP, 2011. Reproduction can occur only with the express written permission of FHBP and credit must be given to FHBP.